Things just have not been going good for Nokia these days. Rumored to be on the acquisition list of companies from Microsoft to Samsung, Nokia recently lost its place on the top of the list of the world's largest smartphone manufacturers after 14 years as number one. Not only did Samsung replace Nokia at the top of the list, but the Finnish company dropped all the way to number three as Apple took over the second place slot. Now, Nokia is closing many of its online stores, although negative sales momentum is not the reason cited by the manufacturer. Sites in the U.K., Spain and France have been shuttered because Nokia wants to concentrate on selling to carriers instead of directly to end users of its phones. And by offering its handsets through mobile operators, buyers will be able to take advantage of the subsidies that carriers offer in order to lock you up with a contract. 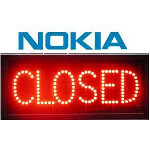 As a result, the move away from direct sales could be a boon to Nokia. The only question is if it too little, too late. I'm going to flip out if they stop selling unlocked phones.